It's time to get creative with LED's thanks to the BrightDot wearable collection!BrightDots are small and wearable modules with one or more LED's that need to be controlled by an Arduino compatible development board.The entire collection includes a series of diverse modules with addressable RGB LED's that can be controlled individually. We also developed a unique Arduino compatible VMW101: ESP32 Wearable Development Board that you can use to create something bright & wearable that's also smart.This set includes 2 threefold BrightDot strips and 2 fivefold BrightDot strips. Each PCB is super thin and includes gold plated contacts with 6 sewing holes of 1.22mm. 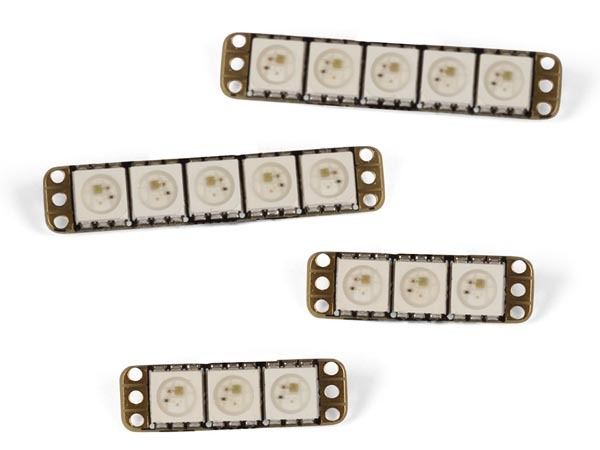 Also, all models have backup lines to ensure that one broken LED does not affect the others.Every LED is controlled by 3 wires (power, ground & data) and can be connected via these wires to the next LED, creating a big string of LED's. You can solder these LED's in electric circuits, or sew them into clothing, onto backpacks, onto shoes etc.